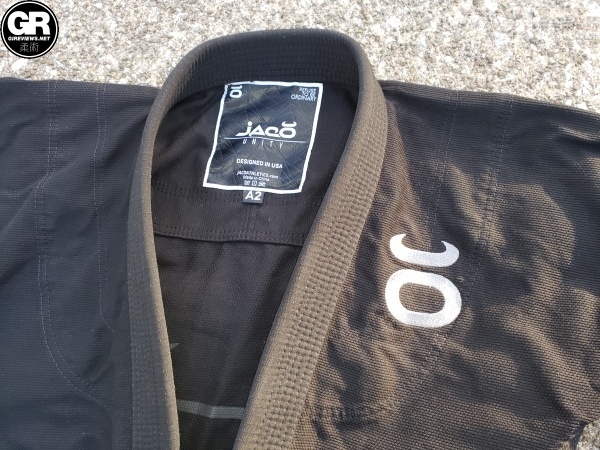 Back when I first started training seriously there were a few old brands that had big name fighters on their sponsorship rosters, one of those brands was Jaco. Jaco’s aesthetic was always clean and when they stopped putting out products for a while I wondered what had become of them. 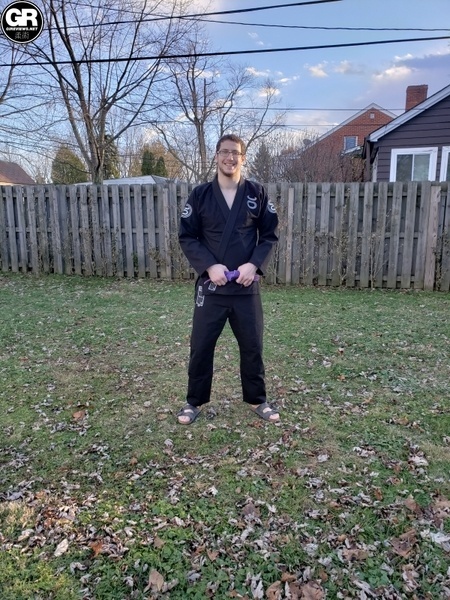 Well, Jaco is back and they’ve released a line of gis, I had an opportunity to try one of them. How did it fair in comparison with other gis on the market? 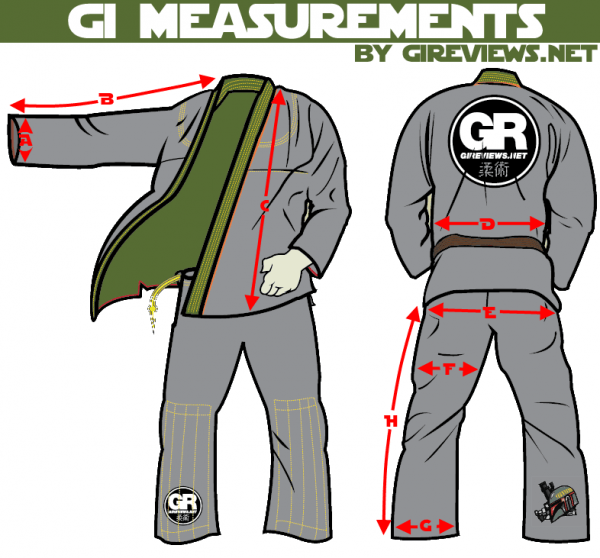 This Gi was submitted to me free of charge (by way of gireviews.net) for review. I have never done any work with or for Jaco. Jaco is an OG brand in the MMA and jiu-jitsu world. 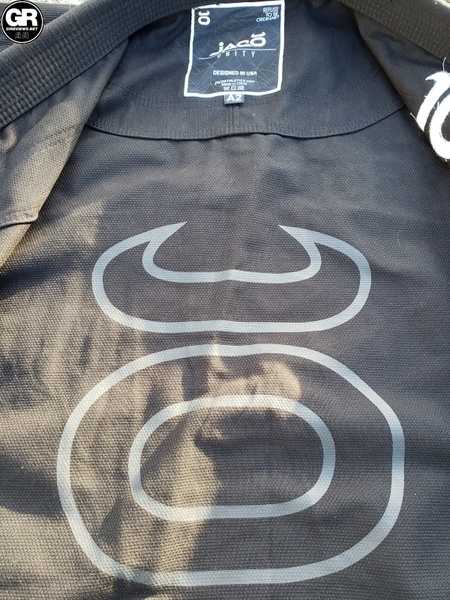 Characterized by clean designs, a specific somewhat unique typeface and an unmistakable logo (a circle with a semi circle above it… is it a bull? Is it an umlaut? 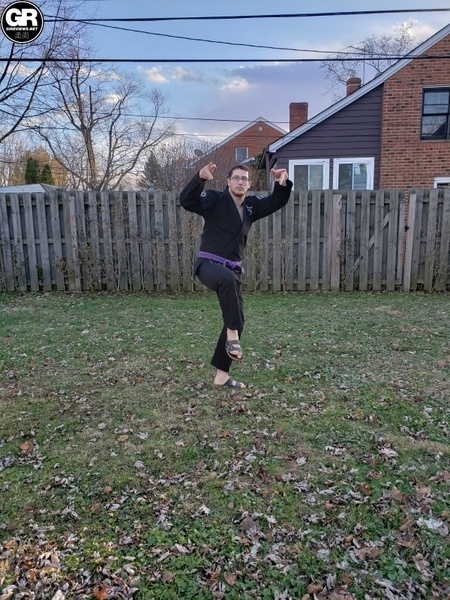 The world may never know) Jaco has long been a staple for martial arts gear. When I heard that Jaco was coming back to the market and releasing some gis, I was intrigued. Would their new products be of high quality? Would the Jaco aesthetic still pop? 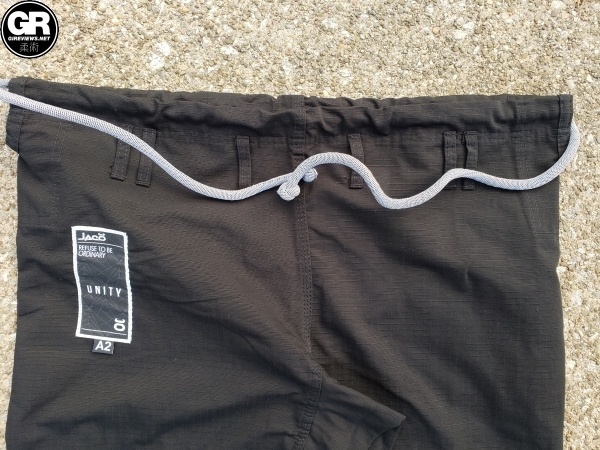 Jaco sent me one of their “Unity” gis, a Chinese made lightweight gi. It arrived in simple packaging, no extra goodies. 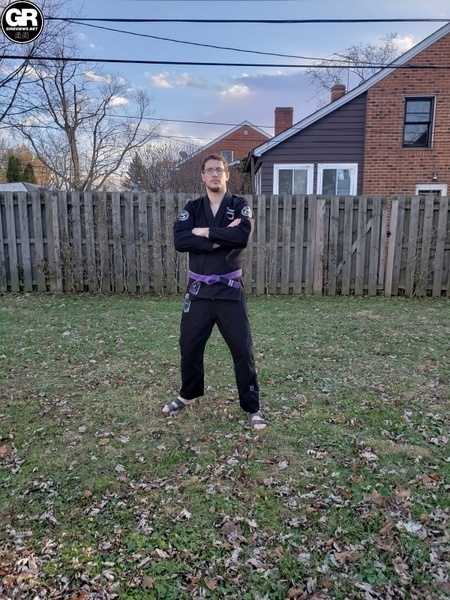 Upon unboxing the gi I found that it was definitely an attractive product, but how would it stand up to 4 months of my rigorous training regimen? I’m 6’1, 195. The best fit for me is usually an A2L. Jaco opted to send me an A2 and I found that this specific A2 fit me great. It was just a tad snug but the fit was very comfortable for training. 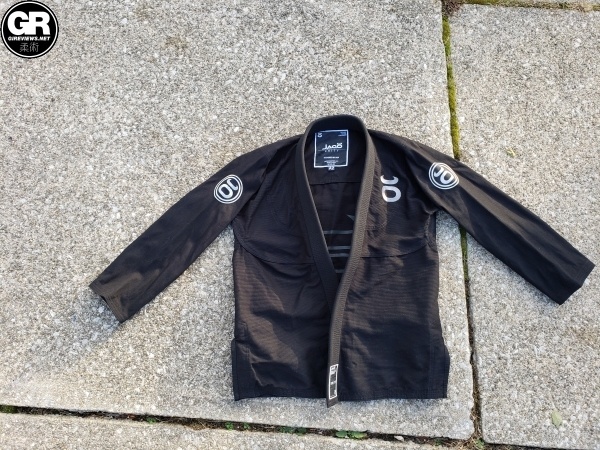 The design of the Jaco Unity gi can be defined as “Clean” but it does have some pretty cool features that set it apart visually from other gis on the market. 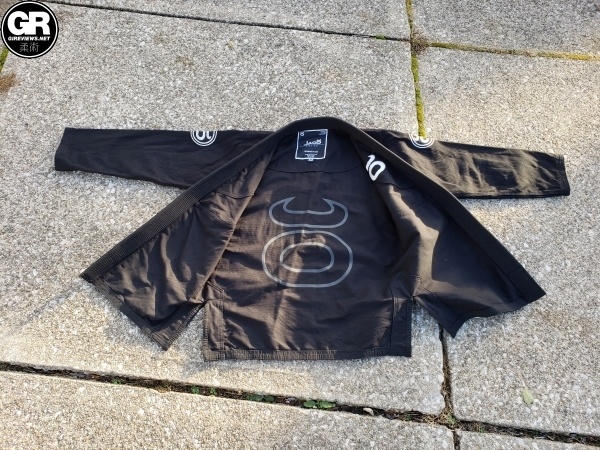 The jacket has the Jaco logo on each shoulder and the Jaco brand name between the shoulder blades, and a Jaco logo on the left side at heart level, but the real party is inside of the gi with a large Jaco logo printed inside the back of the gi. This was a high quality print that didn’t wear out at all. 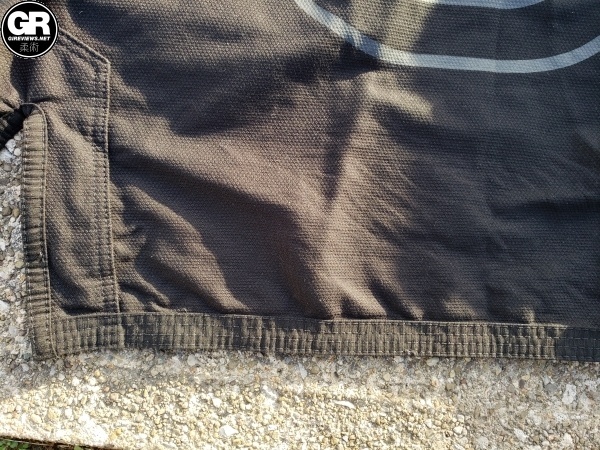 The seam tape and trim throughout the gi is the same black rip stop from which the pants are made. Jaco went with a clean black, shiny black and silver color palate but the gi definitely felt like it had a nice bit of flash to it. In case you couldn’t deduce from what I’ve written: I was a big fan of the aesthetic of this gi. The 350 GSM jacket of this gi is made of a dense, sturdy Chinese pearl weave. 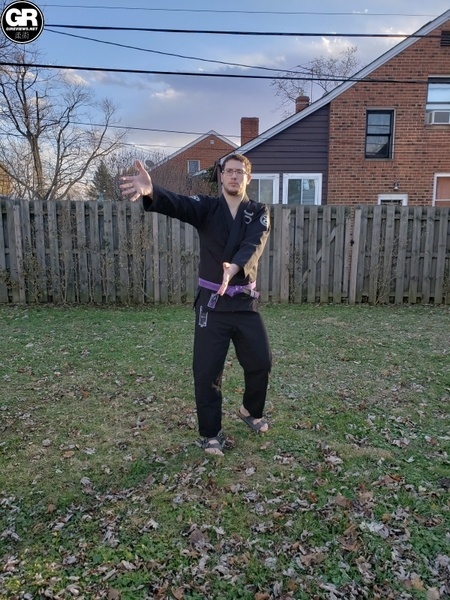 I often talk about different pearl weaves from different countries, I’ve found that Chinese pearl weave doesn’t stretch, and this held true for this gi which made it feel great to roll in. 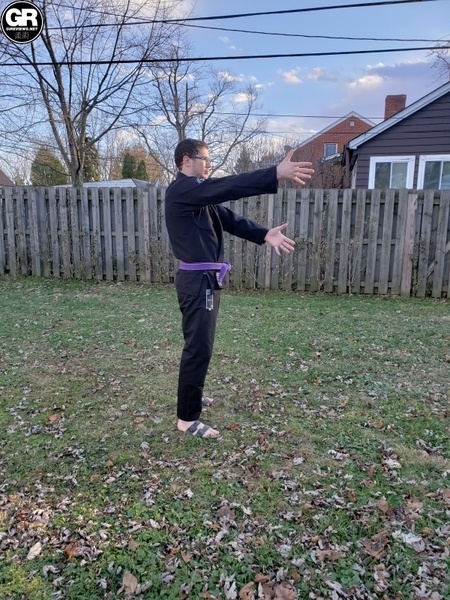 The rip stop covered EVA foam collar is of medium thickness, I liked the thickness for this gi, and found it to be sufficiently stiff while at the same time not so much so to be uncomfortable. 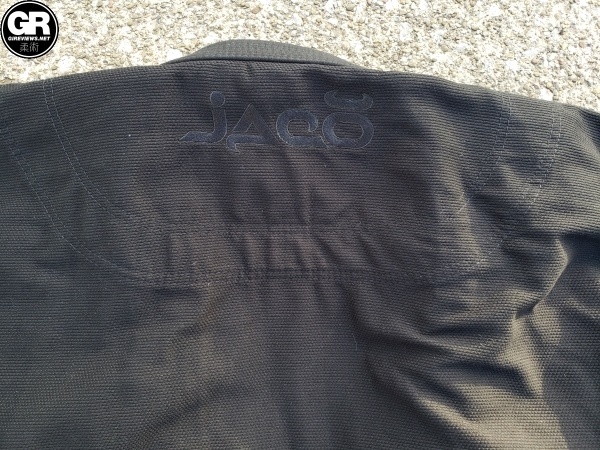 The design points on the jacket are 2 round Jaco logos on either shoulder, both in shiny black and silver embroidery and an embroidered Jaco name plate between the shoulder blades. The jacket also has a nice little branded patch at the bottom of the lapel that I mention because it has a cool textured pattern to it. The inside of the jacket is where the party’s at with a dark grey Jaco logo emblazoned all across the inside of the back of the jacket. This was a durable print that didn’t wear out during the review period. The dense yet lightweight jacket pairs nicely with a dense yet lightweight pair of rip stop pants. 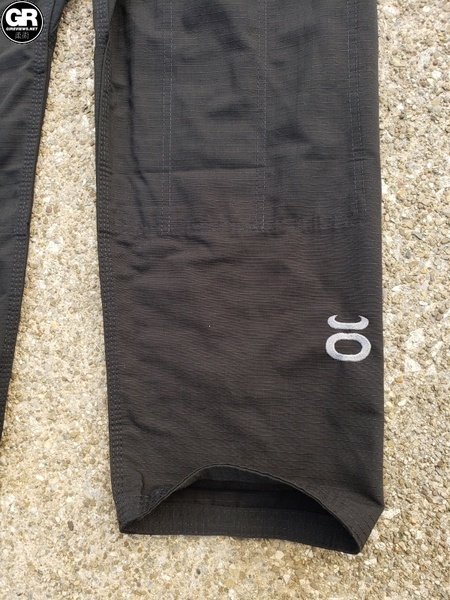 The trousers of this gi are, like the top, Clean with a capital C.
They feature exactly one embroidery: a Jaco logo on the left shin. They also have a similar patch to the top over the right thigh. 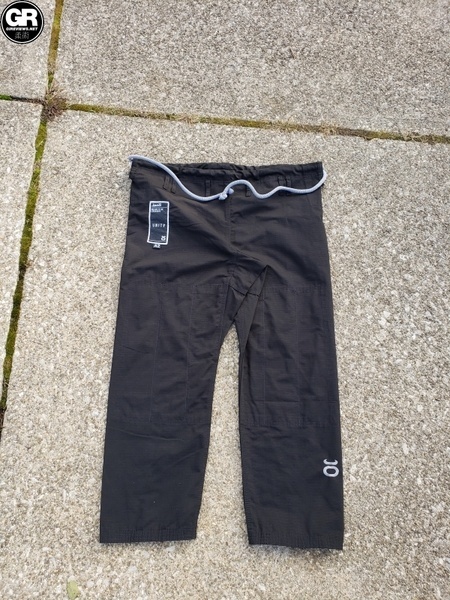 The 6 loop closure system is paired with a light grey stretchy rope that is tied off. 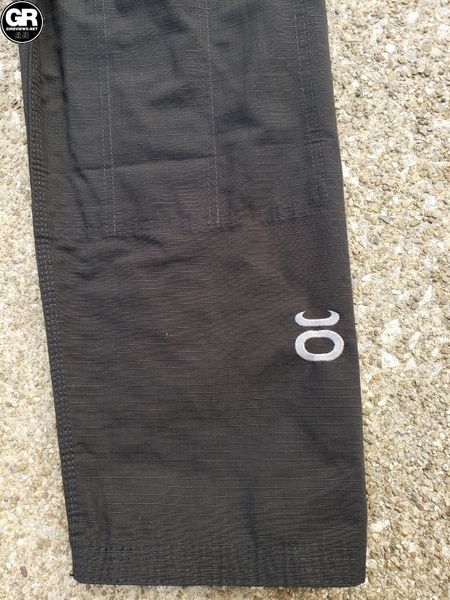 The double layer knee covering stops mid shin. 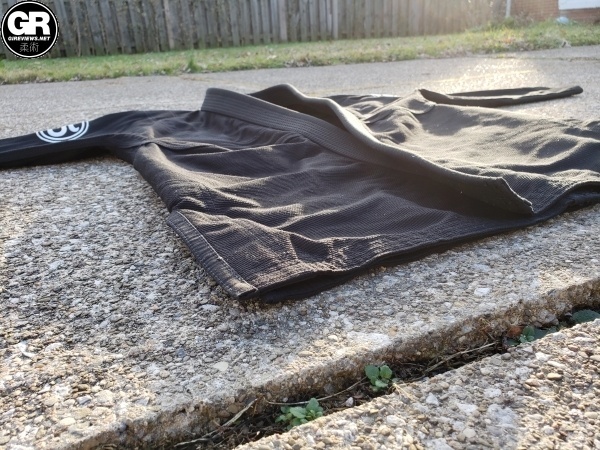 There’s not much to say about the pants, I found the rip stop to be very sturdy like the rest of the gi. 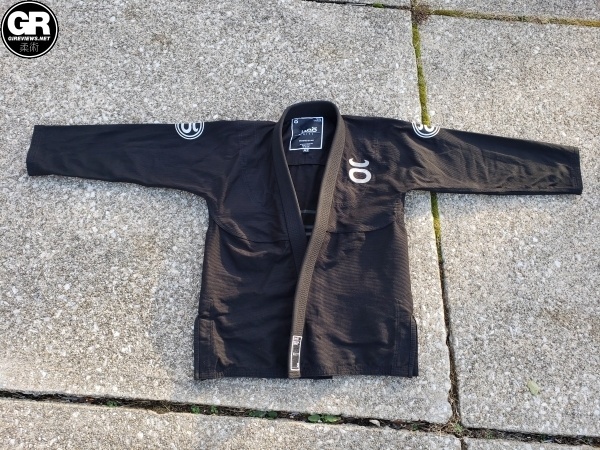 Lack of stretch, good yet snug fit, lightweight… This was a great gi to roll in. 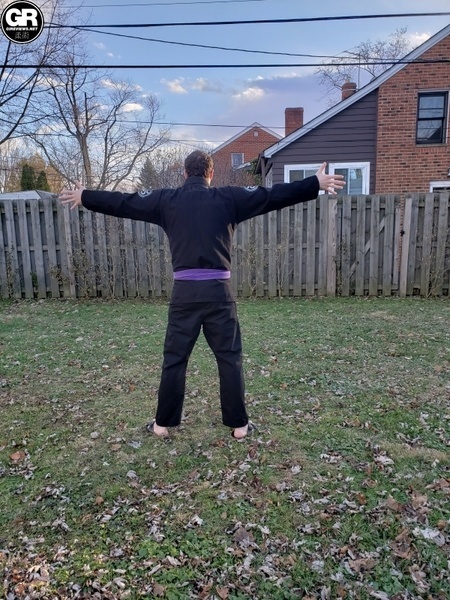 The snugness might make it IBJJF illegal (though I’m sure if I relaxed my entire body while being checked I could get away with it.) 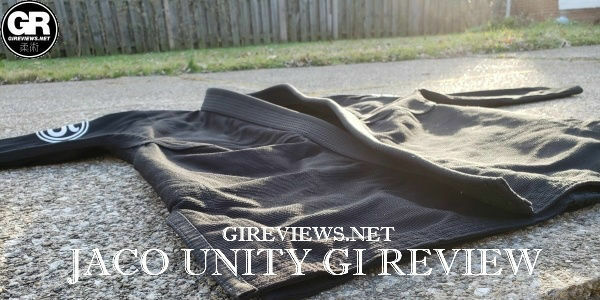 Honestly this gi was one of my favorites to roll in of my most recent batch of reviews. I highly recommend it. 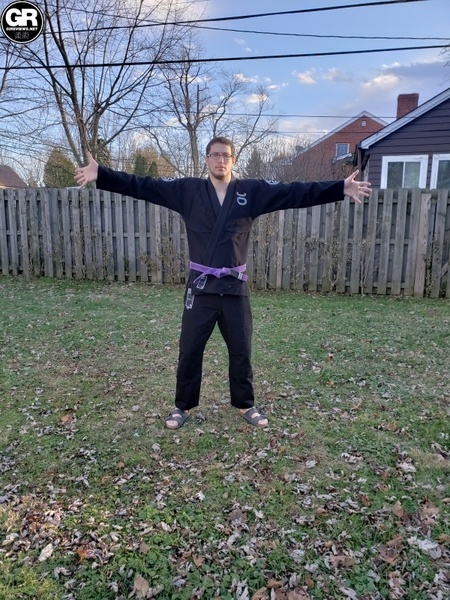 Jaco’s comeback seems to be successful with this awesome gi. I’m definitely a fan of the direction they’re taking their designs in, and expect big things for the company if they are able to re-penetrate the market.